Ballcraps lets you easily bet with your friends on any play during a game. Like many great ideas, Ballcraps was conceived at a bar. While watching the BCS Championship game, the guys had a few friendly arguments about the outcome of each drive. The bookmaking needed to be fast so we arrived at an incomprehensible shorthand. There just had to be a better way to track these fast-paced bets. So we drew up the most common bets on a dry-erase surface and used poker chips to track our bets. After several sessions, we set up the board you see today. We designed a home set that anyone could buy and play at home with their friends. 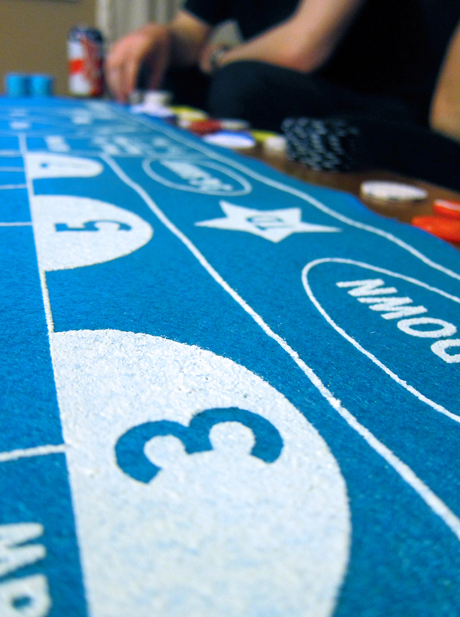 The Ballcraps board was screen-printed on felt, standard poker chips were used for betting chips, and light plastic chips for odds markers. Everything is assembled in a clear plastic tube for storage and shipping. The home set was sold first on Kickstarter at the beginning of the 2011 football season, and has since been available for purchase on etsy. There are far more images available for Ballcraps, but these are the ones we felt would be most useful to you. If you have specific requests, please do contact us! There are currently no logos or icons available for Ballcraps. Check back later for more or contact us for specific requests! ""It's the perfect way for a room full of armchair quarterbacks to prove who actually knows the game the best."" 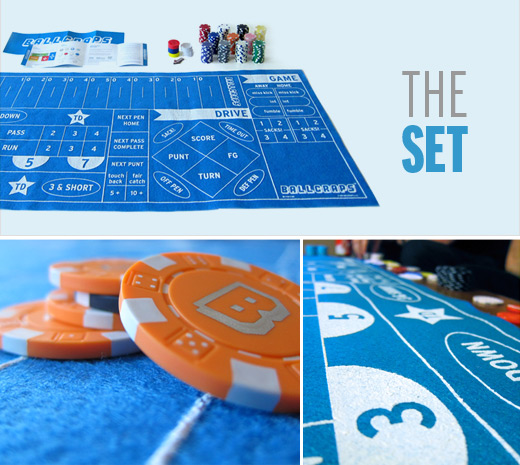 "The "perfect solution to bet with your friends while watching the game""
You can buy the home set on etsy: etsy.com.